Oh i really like it! Congratulations on finishing something so time consuming! 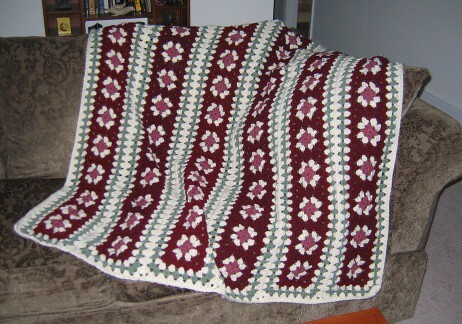 I get so tired of doing the same thing over and over again that i’ve never finsihed an afghan. I start them and then conveniently find something else to do…..short attention span. That is wonderfull! How did you do the sewing together? That looks so neet!!! Great job, I am not very good at making huge projects like this, you should be very proud. Cristina… I whip-stitched through both parts of the V on each side (I know there’s a better way to say that), basically just carefully matching it up. It wasn’t too tough to keep track of, because I knew I had the 3 stitches of the granny, plus the space between, so I didn’t get lost. Once that was done, the rest was just edging forever, and ever, and ever. 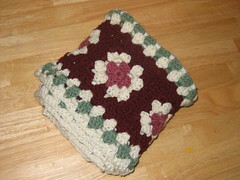 June… I totally did pick up something easy, though not small… My current project, while it is an afghan, is strictly one giant granny, easy and mindless and NO ENDS TO WEAVE IN. I had bought $24 worth of yarn that should have cost $200 (wicked sale), and had to do *something* with 24 skeins… so I’m basically doing it until I run out of yarn. So far so good! That is a great story, don’t forget to show us you giant granny when it is finished. Don’t you love a great deal on yarn??! !